JUNEAU — For the third time in state history and the first time since 1981, the Alaska House of Representatives has begun its regular legislative session without choosing a leader. In a floor session that began Tuesday afternoon and extended into the early evening, House lawmakers continued a deadlock that began in December when Rep. Gary Knopp, R-Kenai, announced he would seek to create a bipartisan coalition rather than join 20 other Republicans in a bare-minimum 21-person majority. The deadlock will continue into at least a second day: Shortly after 5 p.m., the House adjourned until 1 p.m. Wednesday. As the 31st Alaska Legislature begins without a House speaker, House staff could go unpaid, legislation cannot be introduced and Gov. Mike Dunleavy could be forced to delay his State of the State address. The deadlock has also prevented one of the House’s 40 members from taking her seat. With no temporary or permanent speaker of the House to take up the gavel, Lt. Gov. Kevin Meyer acts as a temporary presiding officer. When Meyer attempted to confirm Dunleavy’s appointment of Sharon Jackson to represent House District 13 — the elected representative, Nancy Dahlstrom, accepted a job as Dunleavy’s corrections commissioner instead — Rep. Chris Tuck, D-Anchorage, rose from the floor and declared that accepting the appointment was beyond the lieutenant governor’s powers. “This is really out of order,” Tuck said, explaining that the House needed to first choose a leader of its own. The dissent sparked an extended break in the proceedings as lawmakers consulted the Alaska Constitution, statutes and legal experts. “We’re going to not take up the letter at this particular time, the letter sent to the House Republicans,” Meyer said, acknowledging that Jackson would not join the House immediately. About 2:30 p.m., Rep. David Talerico, R-Healy and the likely speaker of the House if Republicans hold a majority, asked Meyer to adjourn the House until 5 p.m. in order to allow new representatives to sign their oaths of office. As Jackson — seated in the House’s gallery — left the chambers, she was escorted by Rep. Tammie Wilson, R-North Pole. As the Daily News attempted to ask Jackson a question, Wilson said, “Not right now,” and ushered her away. Under the Alaska Constitution and the rules that govern the Legislature, a vacancy is filled by the governor, whose choice must be confirmed by legislators belonging to the appointee’s party. The problem Tuesday was that without a speaker of the House, there is no one able to formally receive the message from the governor and thus start that process. “It’s a little ambiguous, but it clearly does not state the lieutenant governor has the authority to go ahead and do that,” Knopp said of the Constitution and the Legislature’s uniform rules. The closest guide may be from 2003, when Dahlstrom herself was appointed to replace then-Rep. Lisa Murkowski, R-Anchorage. Murkowski had just been named to the U.S. Senate by her father, Gov. Frank Murkowski. When Dahlstrom was appointed after the 2002 election, the House waited until after Speaker Pete Kott was voted to accept the message from the governor appointing Dahlstrom and the message from House Republicans confirming her. Because there was no delay in selecting Kott — who was approved 39-0 — there were no problems seating Dahlstrom. Knopp said he doesn’t believe Tuck was out of order to request that an interim speaker of the House be chosen before seating Jackson. Talerico said he doesn’t believe there’s any other motive to Tuck’s move beyond preserving the separation of powers between the lieutenant governor, a member of the executive branch, and the Legislature. “I think that’s where they’re really at,” he said of Tuck’s move. Talerico said he’s heard people refer to any resolution of the deadlock as a finish line, but he doesn’t think that’s appropriate. “The finish line, what we’re talking about, is the beginning line of the session,” Talerico said. In the Senate, first-day events were conducted with ceremony and a lack of surprises. 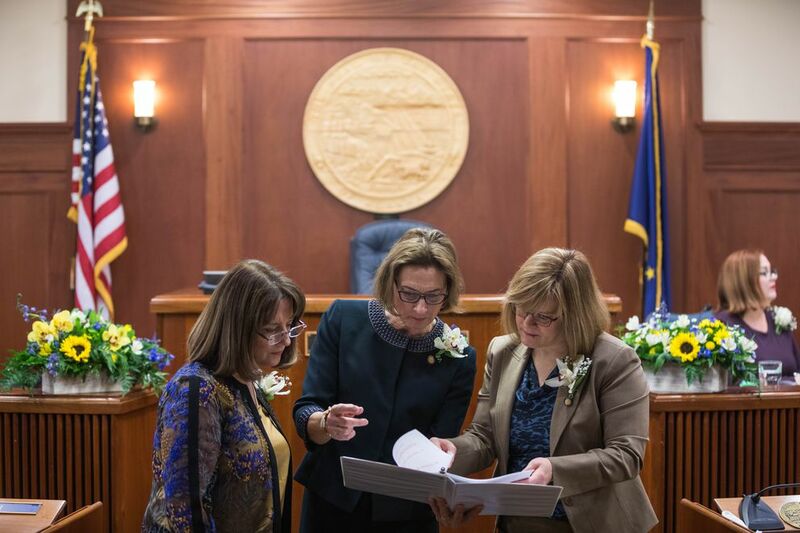 Senate President Cathy Giessel, R-Anchorage, took office on a unanimous vote. She becomes one of at least 14 female presiding officers of legislative bodies nationwide, according to figures compiled by the National Conference of State Legislatures. Of the Senate’s five new members, three have previously served in the House. Sen. Lora Reinbold, R-Eagle River, Sen. Scott Kawasaki, D-Fairbanks, and Sen. Chris Birch, R-Anchorage, served in the House during the 30th Legislature. 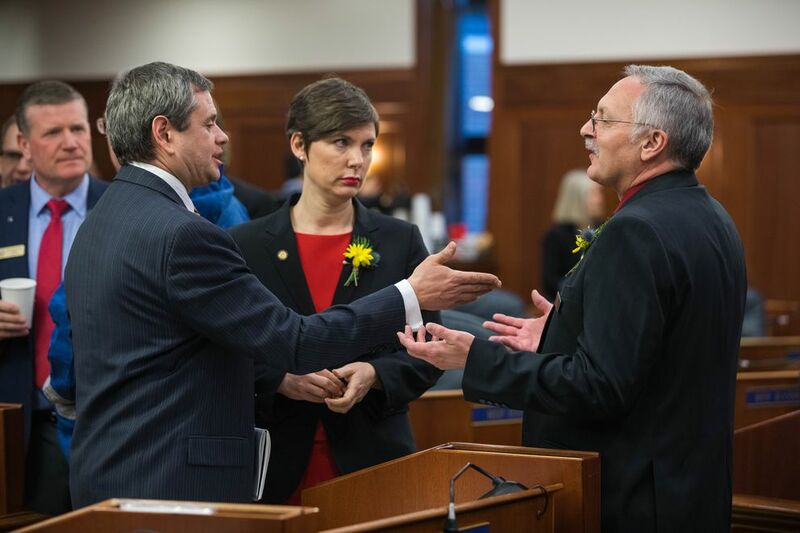 Sen. Jesse Kiehl, D-Juneau, and Sen. Elvi Gray-Jackson, D-Anchorage, are new to the Legislature, though Kiehl is a longtime aide to Sen. Dennis Egan, D-Juneau, whom he replaces. A 14-member Republican-led majority (it includes one Democrat) controls the 20-member Senate, and Sen. Bert Stedman, R-Sitka and co-chairman of the Senate Finance Committee, said his group is ready to begin its work.